Please check the remarks below. Avastar now checks for outdated Rigs right after loading an old Blend file. 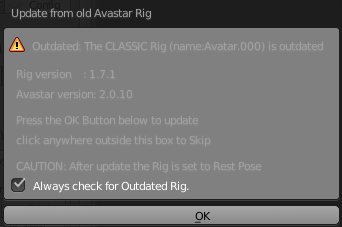 If Avastar finds an old rig, then it creatres a popup window from where you can start the Rig Update tool. We try to make this update tool as forgiving as possible to get all your creations updated with minimal work. However we can not prepare for all possible scenarios. Please report if the Rig update tool does not work for you. Avastar now only exports bones which have associated weight maps for at least one of the exported Meshes. 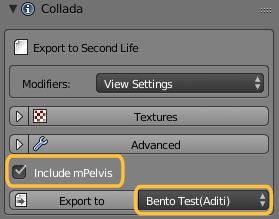 Please keep the option “include mPelvis” enabled when you plan to import your collada file to SL with joint positions enabled. See my previous post in this thread for an explanation. Please use the export option Export to Bento Test(Aditi) See image above.